Whether it's a holiday, temporary accommodation, workday ‘crashpad' or an extended stay that is needed, Pippa and Carl offer a warm welcome in both The Little Red House and The Little Red Outhouse. 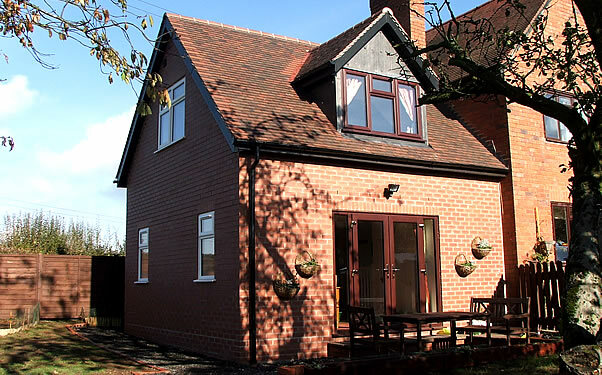 Based in the village of Fairfield near Bromsgrove, Worcestershire, UK, the private home-from-home guest accommodation is just minutes from junction 4 of the M5 and a perfect solution for families, professionals and visiting relatives. The larger of the options – a charming, peaceful annexe to our own home (The Red House) that can accommodate families as well as students, couples and individuals. Guests have their own spacious sitting / living room and upstairs is an large airy bedroom that can be arranged as either a superking, twin or family room to suit (i.e. for friends, colleagues or parents and child). It has stunning views out across open farmland, a large wardrobe, dressing table, chest of drawers, side tables and easy chair. The en-suite bathroom has a large shower, heated towel rail and luxury towels & linen are provided. A hairdryer and iron are available. There is also a very comfortable double sofa bed downstairs, meaning up to four or even five can be accommodated easily. The Little Red House has its own garden, off-street parking and lots of extras including a large TV with freeview, free wi-fi, a small fridge, toaster, microwave and kettle. PLEASE NOTE: The accommodation is NOT self-catering. There is no oven or sink. This cosy, well-insulated and separate building that has been converted into a private bedroom with an ensuite shower room. It can be used as an add-on to The Little Red House if an additional bedroom is needed, but equally works very well as a ‘crashpad' when people are working or training nearby, but don't live locally. Previous guests have also included students during school holidays and recently separated spouses, in between homes. Like The Little Red House, The Little Red Outhouse has its own entrance and parking space. It also has TV, internet connection, mini fridge, microwave and kettle. Bedlinen and towels are included. PLEASE NOTE: The accommodation is NOT self-catering. There is no oven or sink. Rental is for a completely separate, ensuite bedroom only, that is approximately 16ft x 8ft. Guests do not have access to a kitchen, living space or other rooms within our home and due to its size, the bedroom is best suited to single occupancy. Both The Little Red House & Outhouse are available and priced on an exclusive basis – the whole space is yours for the duration of your stay . Where both are showing as available simultaneously, they can be booked individually or together. Prices include bedlinen and towels. For stays exceeding a week, laundry washing can also be arranged.